2 split buttermilk biscuits hugging a fried chicken breast, 2 eggs, and cheese, under a blanket of homemade country gravy. Sweet & savory classic! Crispy fried chicken breast atop a sweet Belgian waffle with butter and maple syrup. Great-Grammy’s family recipe! Bacon-wrapped, all-beef meatloaf served with mashed potatoes and homemade country gravy. 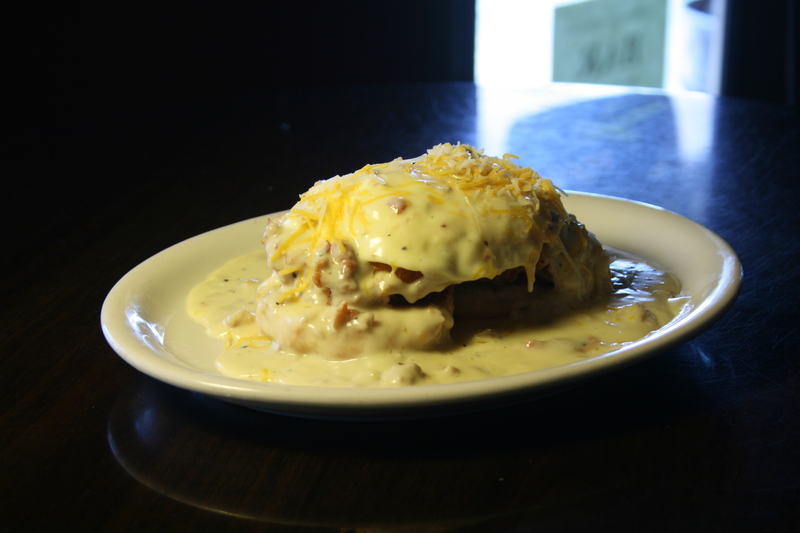 Choice of fries or tots, layered with Black Angus beef or sausage, cheese, and country gravy or chili. Topped with 2 eggs.